From the creators of Cars, Up and Toy Story 3 comes a new Pixar classic in this high-octane Blu-ray! 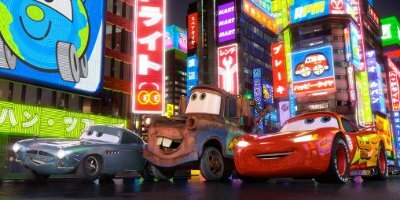 Star racecar Lightning McQueen (Owen Wilson) and the incomparable tow truck Mater (Larry the Cable Guy) take their friendship to exciting new places when they head overseas to compete in the first-ever World Grand Prix to determine the world's fastest car. But the road to the championship is filled with plenty of potholes, detours and hilarious surprises when Mater gets caught up in an intriguing adventure of his own: international espionage! Experience all the fast-paced fun with an "all-car" cast – plus enjoy the hilarious, never-before-seen short film "Air Mater". The pedal-to-the-metal excitement continues with a full disc of exclusive "Around The World" bonus features. My kids are really enjoying it. Nice film. The story in Cars 2 is quite funny. It has an interesting plot and in my opinion Cars 2 is better than the first Cars movie. However, I personally cannot fully warm up to Cars. 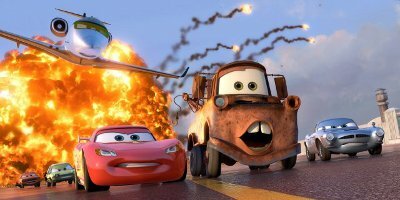 Might be that Cars is very much more aimed at kids than the other Pixar films (all others had more elements that were funny for adults) but from my perspective it's the weakest of all Pixar productions. Which still makes it a great animation movie, just not Pixar's best. It has great picture quality. Come on, what do you expect? It's Pixar's newest, and on Blu-ray. The blu-ray is not lavishly equipped with bonus features though. These are basically limited to two short stories and a few trailers. To say my 2 year old is a huge Cars fan, is an understatement. He has a massive collection of the toys, loves the first film, and Mater's Tall Tales too. Cars 2 is just as good as previous film and cartoons, as it is so full of little nods that never get old with repetitive watching (which all parents know comes with buying children DVDs!). The Dolby Digital soundtrack is superb and tests any speaker system to its full. I think it's a great disc, and one of the best modern Pixar films too! Very good family movie. Only blu-ray, no digital disc. Cars 2 is an excellent DVD for both kids and adults. It's well worth a viewing. Great entertainment for the whole family. We enjoyed it just as much as the kids. The animation is of the highest standard and great voice overs from the likes of Owen Wilson and Michael Caine. The kids liked it so much they've watched it 3 times already. Definitely one for the collection. I brought Cars 2 on Blu-ray, as it stated that I could redeem a DVD of the film, via the enclosed claim voucher. However, I am very disappointed that the date for this had expired, prior to my purchase. I'm really pleased with Cars 2 on blu-ray, especially seeing as I was getting Cars 2 on standard DVD as well, but when I received my purchase, the extra copy was out of date, and I was unable to use it, so felt a bit misled. If you have not seen this, then you must! My kids loved and cannot wait to have a copy of their own! Since watching this they have watched the 1st movie over and over. Your kids are gonna love this! P.S, dads too!